Mydax, Inc. provides custom designed and manufactured temperature controlled recirculating liquid chiller systems, including air-cooled and water-cooled refrigerated chillers, outdoor-rated refrigerated chillers, and non-refrigerated recirculating liquid-to-liquid and liquid-to-air heat exchangers. Virtually all systems are available with heating capabilities and particulate and/or deionizing filtration, when applicable. All systems offer patented proportional temperature control using an embedded microprocessor. Applications include chemical, pharmaceutical and biotechnological processing, semiconductor and fiber optic manufacturing, aerospace, defense and automotive testing and medical instrumentation temperature control. 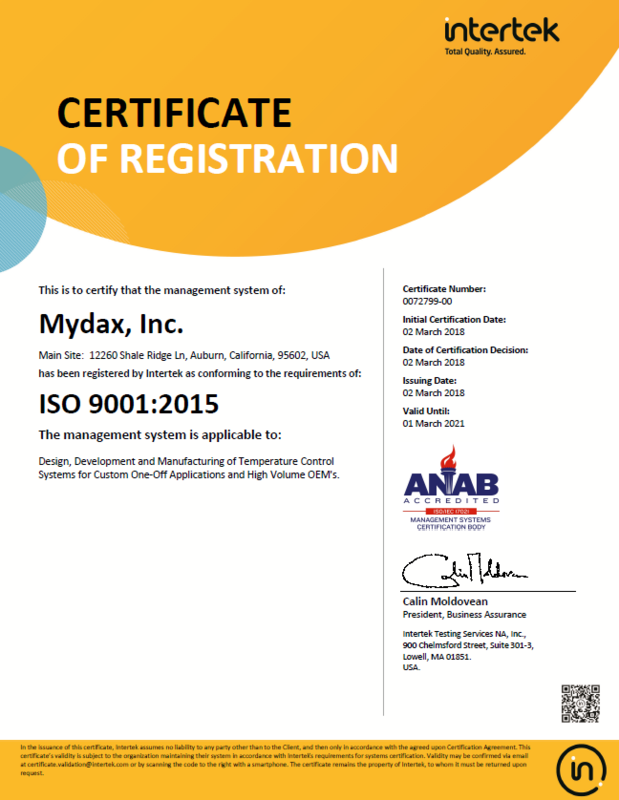 Located in the Sierra foothills of northern California, Mydax is committed to building only the highest quality temperature control systems available, combining our skills in areas of electronics, refrigeration and advanced materials. Since 1986 Mydax has been known as the chiller manufacturer to provide innovative solutions for demanding temperature control problems. Mydax was the first chiller manufacturer to offer proportional refrigeration control. Proportional control, combined with an embedded microprocessor operating with proprietary software, empowers the Mydax chiller to achieve important customer benefits. Most of the wear and breakdowns associated with chiller operation are caused by temperature cycling of the refrigeration circuit plumbing and components. This cycling, long associated with conventional chillers, is eliminated in the Mydax design. Our proportional refrigeration design smoothly adjusts the flow of refrigerant along the compressor’s power curve, based upon the amount of cooling required. If elevated cooling power is required, refrigerant is efficiently regulated for maximum flow to the evaporator. When diminished cooling is required, refrigerant flow to the evaporator is reduced while refrigerant not required for cooling is diverted to the bypass heat exchanger. Using this method of proportional flow control, the Mydax microprocessor eases thermal stress on components. Every Mydax chiller is ruggedly built and thoroughly tested. We strive for the quality that our customers have come to depend upon. Our components are chosen from only the most reliable manufacturers and each chiller is carefully constructed by knowledgeable builders. All units are then thoroughly inspected and tested to ensure they meet design specifications. Steel tube frames are completely welded, eliminating the weaknesses found in typical bolted-together sheet metal designs. All permanent copper fittings in the refrigeration circuit are brazed, eliminating leak-prone flare fittings and low-temperature solder joints and all permanent copper joints in the refrigeration circuit are brazed for extra strength. The recirculating fluid plumbing and much of the refrigeration circuit is insulated to minimize cooling capacity losses and unpredictable operation due to drafts or fluctuating ambient air conditions. All Mydax chillers are equipped with a wide variety of safety devices and status alarms. RS-232 Serial , RS-485, LAN Network and Analog Interface are all available options. All Mydax systems are thoroughly tested under conditions which are customized in accordance with design specifications. Final performance testing includes prolonged temperature cycling against active external heat loads to simulate the customer’s intended application. Test results are provided to the customer, along with a custom-written user’s manual at the time of shipment. KwangShin Machine Ind. Co., Ltd.
One of our goals over the past twenty five+ years has been to develop extremely reliable systems which provide elevated cooling power at consistently lower temperatures than industrial chillers regularly offer. As of today, our products cover temperature setpoint ranges from as low as -80°C to as high as +150°C. Due to demanding temperature conditions, Mydax employs recirculating pumps with no rotating mechanical seals whenever possible.